As we celebrate the glorious birth of the Lord Jesus, we pause in sincere thanks for your support for our work on His behalf. May you and those you love enjoy His Peace, now and always. God bless you! WE WERE CARDED! 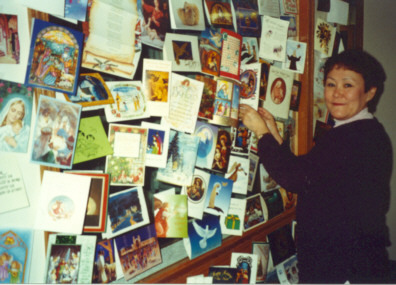 (left): Business manager Florence Busch reads a few of the many lovely Christmas cards sent to our mission. The cards provide colorful decoration to the studio windows in the station's main corridor. Thank you to the many friends who help cheer our holiday this dark time of year, not only by your thoughtful cards and notes, but also by your prayers. 3 HOURS, 54 MINUTES: That's how long we'll see the sun on December 21st. This time of year, it barely rises above the frozen ocean, casting long, long shadows. Though grazing the horizon, the sun can shine brilliant and hard when the sky is clear. On a hazy day, the red sunrise merges with the red sunset, illuminating the snow-covered hills to the color of peach ice cream. TRIM: As Christmas approaches, we decorate our air signal, just like trimming a tree. We're filled with Christmas spots and Christmas hymns and songs, 24 hours a day. You'll hear Christmas prayers and stories of Christmas traditions, as well as the many Christmas radio plays produced by KNOM staff over the past thirty years. Christmas Day is a work day for the KNOM staff, though we try to keep the load as light as we can for everyone. Each of us promises to remember you as we worship at Christmas Mass. 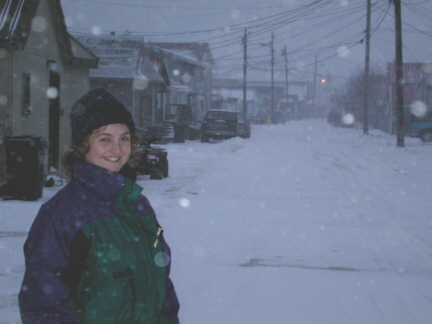 SNOW BUSINESS (left): Volunteer public affairs director Victoria pauses long enough for a photo outside the KNOM studio building during the season's second major snowstorm in early November. A graduate of Providence College, Victoria hails from Pelham, NY. The wind chill was just below zero as the picture was taken on a dark noon. In Nome, the ground is likely to remain white until May or June. Please consider adding missions like KNOM to your will. Your gift can continue serving God's people long into the future. Our mission prayerfully places all bequests into funds that provide for future emergencies and long term major improvements. CHRISTMAS INSPIRATIONAL SPOT: The birth of Jesus was the most wonderful event in all of human history. Mary responded with humility and obedience, the angels and shepherds with awe and joy. Herod, however, saw this wonderful event in a different light, meeting the coming of Jesus with fear, jealousy and rage. Herod's panic closed his mind to the great promise Jesus brought. Today, we, too face fears and hurts that can close our minds to the Christ Child. God is near us every day, waiting with open arms for us to come to Him and be loved, comforted and helped. 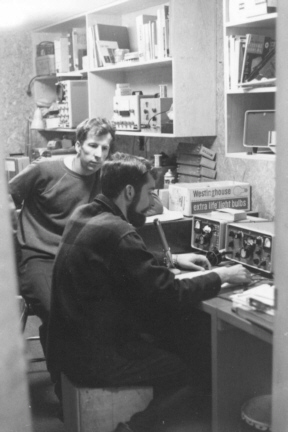 top THIRTY YEARS AGO (left): December 1970, KNOM volunteer Alex Hills "hams it up" in the engineering shop for Brother John Huck, SJ. 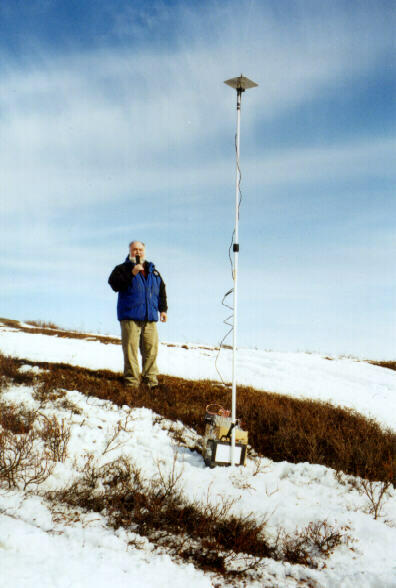 Nome had only meager long distance service back then, and Alex was setting up a holiday "phone patch" for Brother John to the Lower 48. At the other end, a fellow amateur radio operator connected his radio to a telephone, allowing Brother John to speak with loved ones. Less than one year later, Brother John lost his life in a tragic boating accident on the Yukon River. ESKIMO STYLE (left): Three years ago, the Nome parish's crèche figures were in very bad repair. Thanks to hard work by the Little Sisters of Jesus, the scene now depicts Mary, Joseph and the Infant's worshippers in customary parkas and pullover dresses known as kuspuks (KUSS-puks). The gifts at the feet of the Infant Jesus are a bowl of tundra berries and a bowl of traditional Eskimo fried bread. YOUR PRAYERS ARE REQUESTED: Traveling between villages by snowmobile, a 19-year-old man broke through thin ice and was lost. Please keep him and his family in your prayers, won't you? CHRISTMAS INSPIRATIONAL SPOT: God of Love, Father of all, the darkness that covered the earth has given way to the bright dawn of Your Word made flesh. Make us a people of this light. Make us faithful to Your Word, that we may help bring Your Light into the darkness of a waiting world. CHRISTMAS INSPIRATIONAL SPOT: What does Jesus want at the crib? More donkeys? More shepherds? top LOST: KNOM volunteers Olin Fulmer and Andrew McDonnell returned from the village of Shishmaref (SHISH-mah-reff) with bad news: Over the years, the people of the little settlement have completely lost the knowledge of their traditional Eskimo songs. Olin and Andrew pledged to scour the KNOM archives, to see if we might have some recordings of Shishmaref music from thirty years ago. Home to 547 souls, Shishmaref is located on a sandbar island along Alaska's Chukchi (CHUCK-chee) Sea coast, 126 miles north of Nome. It's been the site of Eskimo habitation for at least several centuries. STAR BRIGHT (left): For the 30th year, the KNOM Christmas Star shines bright above downtown Nome, heralding the birth of Christ. Earlier versions used traditional Christmas lights, which were often ripped out of their sockets or broken apart by storm winds. Les Brown built this five-foot star in 1997. Its frame is tubular steel, using white bulbs encased in tubes of plastic, similar to the lighting strips used by Las Vegas casinos. NATURE'S SUPERMARKET: Some coastal villages fared better than others during 2000 due to different ice conditions, but overall, the harvest of 1,615 walrus was the best hunting in 12 years. 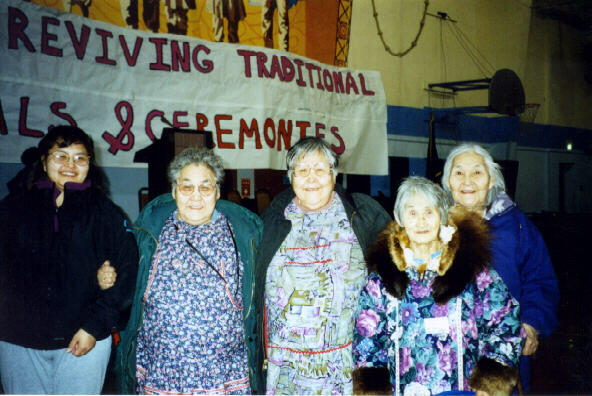 Walrus have been a vital component of Native subsistence for thousands of years, and remain a critical cultural resource, providing small and remote villages with a primary source of food, raw materials, and revenue produced from Native handicrafts. 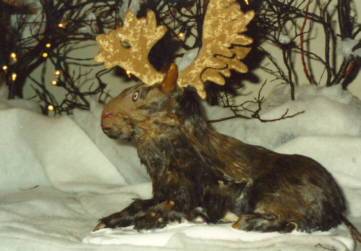 NOT A MOOSE-TAKE (left): A ceramic cow took new form, "Alaskanized" by the Little Sisters of Jesus for Nome's St. Joseph's parish. CHRISTMAS INSPIRATIONAL SPOT: At Christmas, human thoughts and wishes turn to peace. But where to find peace? You are made for God, just as your eye is made for light. You cannot see in the dark. And you cannot find peace except in the Will of God, for His Will is our Peace. Monday: An intoxicated 16-year-old was taken into protective custody. An intoxicated village man was taken into protective custody, as was an intoxicated 17-year-old. Tuesday: A 15-year-old, 16-year-old and 17-year-old were cited for consuming alcohol. An intoxicated village man was taken into protective custody. Wednesday: Three intoxicated village men and two intoxicated women were taken into custody, one to the hospital. There are so many tragedies in this region, aren't there? Thank you for supporting our work as we struggle together to improve the lives of our fellow children of God. NEXT TIME: Our next issue will be a year-end report, including an accounting of our mission's finances. If you have any questions at all about our mission, please contact general manger Tom Busch and he'll be happy to answer them. FACTS ABOUT KNOM: We are the oldest Catholic radio station in the United States, beaming inspiration and information throughout 100,000 square miles of roadless western Alaska, and into Russia, too. Our broadcasts include daily Rosary, Sunday Mass, and hundreds and hundreds of inspirational and education spots, woven among news, weather, interview and discussion programs and popular music. Our programming has won every major national broadcasting award. Our only source of income is you. Thank you for making this work possible! Again, may God abundantly fill you and those you love with His grace and peace. Thank you for your wonderful help. From everyone on the KNOM staff, may you enjoy a happy and holy Christmas! CHRISTMAS INSPIRATIONAL SPOT: Bethlehem and the first Christmas night. You had given us Your only Son. This Christmas, I want to offer Him back to You in the celebration of Mass and with Him, a new gift of myself to You and in service to all of Your children. Copyright 1998-2000 KNOM. All rights reserved.